Naturally, some of you may feel this is a kind of topic dedicated for geeks. It's okay. I had the same feeling too. Hold your thought, stop over-thinking and take your first dive. For the ease of everyone, I won't talk about everything in a single post and you don't need to change every setting just because it exists on GWMT. So this is gonna be a series and will be a reference on using it, like I did for FeedBurner once. Shall we start? Mainly configuration section allows you to set up how you need Google search to treat your blog or website when it comes to indexing and delivering your content on organic search. Let's start exploring each setting, one by one. If you wanna target your content for a specific geographic location, you can make use of this setting. For example, if you have a local business resides in Canada, you can select Canada here and your content will be optimized for searches coming from Canada. But if you wanna target your content for everyone, you can leave it as it is. However if your site has a country code Top-Level Domain (ccTLD) such as .uk, .lk, .in, .au, Google will set the geographic target automatically. This option will be available only if your site has Top-Level Domains such as .com, .net, .info etc. Preferred domain setting is available only if you own the root domain. Here you can select which domain name you need to show in search results. I've selected the URL with www as you see above. So all my blog URLs indexed by Google starts with www.mayuar4ever.com. If I select non-www version, they will start with mayura4ever.com. Further you can set Don't set a preferred domain option too. But that would cause inconsistencies. If Google crawls www version of one page in your site and next time non-www version, your Google search results shows mix of domain names. Take a look at list of URLs below and stick to that option if you would like to display URLs that way in search results. I'd recommend you to select www or non-www version to improve consistency when it comes to Google search results. Here you can change the crawling rate of Googlebots. Generally, it means that you can change how many requests Google should send when they crawling your site. If you set higher crawl rate which means Google send more requests at a time. It's good, isn't it? :) But it might hurt your server bandwidth and when crawling happens, you will experience sluggishness when viewing your site. You don't wanna give a bad impression about your site for readers, right? This setting should be used only if you were advised to change the crawl rate by an expert. Else it's best to let Google determine crawl rate, by specifying Let Google optimize for my site option which is default option. "Your site has been assigned special crawl rate settings. You will not be able to change the crawl rate." Did you remember that I've recommended to submit both versions of your site to Google Webmaster Tools in previous post? Now you just found one reason for that. Have you seen some special links under a site in Google search results? They are called sitelinks. Google scans the structure of a site and displays sitelinks if they are useful for the searchers to navigate through, with the concern of user query. Else Google might display popular pages. However Google won't assure sitelinks for every site yet. The setting here is useful if you see sitelinks under your site in search results. It's to remove any sitelinks displayed if you feel it's inappropriate or not useful there. If the sitelink is displayed under your homepage, you can enter the URL of the page directly in demote field and click Demote. Else if the site link is displayed for another page except for homepage, you have to specify that link in addition to the sitelink that needs to be removed too. URL parameters is another setting that you need to look into only if you have issues with parameters or know how they works. Let's see what are these URL parameters. You will able to see URL parameters everyday if you take a closer look at URLs appears on your web browser's address bar. Though they have parameters appended, they lead to the same content. But Google may not understand as URLs are not alike. Therefore possibly Google might index those URLs with parameters while having original URL indexed. So what is now? Duplication. It's not the complete story. On some blogs and websites, it can be totally a different scenario where different parameters will lead to different content pages. It depends on the URL structure that site follows. URL parameters page allows users to define how Google should react to different URL parameters. It shows the parameters identified and how they were being treated. You can either edit current settings or add new parameters that should be listed in there. This gonna help you if you have moved to a new domain. When you move to a new domain, Google will take time to index pages on the new domain and remove previously indexed URLs from old domain. It won't take day or two, but could be weeks and months for the whole process. Instead, letting Google to be smart and do it for you, you can be smart enough and show Google that from where you have moved to the new domain. 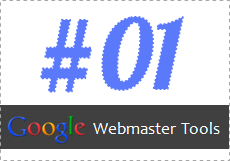 ● You have added and verified your new domain in Google Webmaster Tools. ● Your content is moved to new domain. ● URLs of the old domain redirects site visitors to the new domain automatically using permanent or 301 redirects. Select the new domain you have moved to and submit to Google. Once Google received the request, Google will update the search index with URLs in new domain instead of crawling old domain. It will reflect your new domain and its URLs quickly in Google search results. If you are the one who added and verified your site in Google Webmaster Tools, you will be considered as the site owner. Further you can add more users to your account if you need to let another user to manage your site's presence in Google search. That's where this section gonna be useful. You can add or remove users here. There is two types of users, Full and Restricted. To understand what are they capable of take a look at their permissions. Just click Add a New User button and you can send an invitation to a new user using his/her email address. 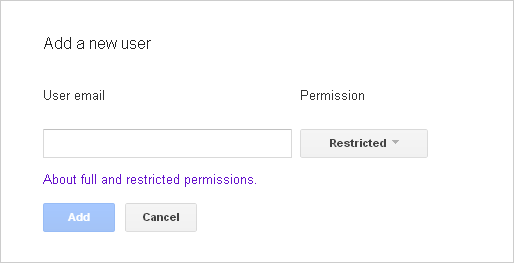 Further you can set the permission level for that user too. If you need to manage site owners, click Manage site owners link to proceed. 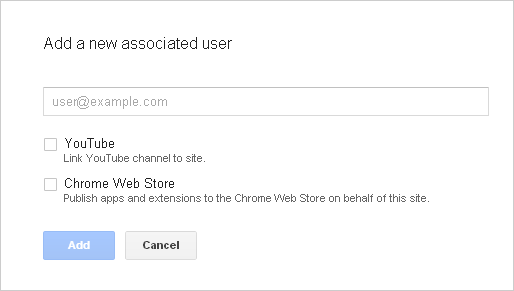 Associates enable site owners to add users who act on behalf of the site with Google products or services. 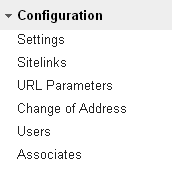 Associates can't view data or manage Google Webmaster Tools settings, but represent your site. Currently it allows to connect a YouTube channel created by someone else for your site or publish applications and extensions to the Chrome Web Store on behalf of your site. It will be useful if your site has multiple YouTube channels under different users or the official channel is managed by another user. Connecting these channels here help Google to understand the multiple online presence of your site. Same goes for Chrome Web Store, as the apps and extensions linked to your site. We can predict that Google will enable more products and services here to understand the multiple presence of your brand or business online. Honestly speaking, there are a few points I never explored about the Google Webmaster tools as they weren't really related to what I wanted to know, or shall we say, I really didn't know about it till now! Yes, most of the things you mentioned I knew and am doing likewise, but things like crawl rate is something I didn't think of exploring as I didn't know much about it. I am so glad you mentioned it here, and let me go and give things a look there, as I've seen a few changes when I visit that though never really understand what it is really. So, thanks for explaining things so well here. You know, mostly we just interested in what applies for us and rest is ignored until we need 'em later on. That's natural :) However when I work on a client website I managed to explore all of 'em. Sometimes even our site's functions properly, Google may have hard time crawling or let you know if your sites infected with malware too. We care security the most, right? :) I hope this series will get you started dear. Wow, Mayura, this is fantastic! Google Webmaster Tools is such a valuable, free service, but it can be confusing. You have done an excellent job of explaining these tools. I have often wondered about choosing to prefer www. or no www. Can you explain which one we should choose and why? I know Google considers www.website.com and website.com as two different sites but I don't know which I should choose. I never looked at the Demote option, and the way you have explained it helped a lot. I did notice that for my techivy website, i do not see any pages coming up though when I google it. Not sure why. I mean, if your URLs starts with www.wonderoftech.com, then go for it. Else you have placed your content on the naked domain, you can go with wonderoftech.com as the preferred domain. You can select the www or non-www option to be consistent on Google search. But sometimes you need to think few steps ahead. If someone sees your URL in search as wonderoftech.com/post but when he lands on your site, he sees www.wonderoftech.com/post. Something strange? ;) But he landed on the right page. However Google crawls default URL structure if you haven't made the choice yet at GWMT dear :) If you select the other version (wonderoftech.com), it will take few weeks to months of time to re-crawl and change URL structure of all posts as you specified. See, after all, it's your preference Carolyn ;) Just need to consider multiple aspects and make sure you are ready for it. Thanks for coming by and contributing your thoughts on GWMAT Carolyn :) AND for the very good question as it will help more folks on decision making. People are going to love you for this Mayura! I know that when I first signed up I found this to be the most confusing service ever. It seemed like it took me months to learn how this works but since I don't go into the set up portion of it anymore I soon forget all the steps you have to take to set up a new site. I have helped a few other people and I often check my broken links here as well. I know a few of my readers who will really appreciate reading this one. Thank you so much for sharing this information and since this is part 1 I know there will be much more information to come. I'll be sure to check back as well because I have a feeling I can still learn more about this. Of course Adrienne :) More to cover on GWMT and stay tune in. Hope the series will help folks get understanding about how to work with 'em. Great tutorial and more to come! Awesome. GWMT is indeed a great tool to influence they way Google indexes your site. It needs some tampering with the settings on there and some should be used with caution - but you explained all that. Can't wait to see the next one in this series, Mr. Google! Wow, so much stuff Mayura. I bet you were thinking about me when you mentioned that some people still didn't get it. I am going to have to go over this in detail and that's a long juicy one with so much information. Thank you for this great piece of information. What if you didn't enter your site in the Webmaster Tools? Coz I tried doing this and I failed. However, if I enter my domain in search I can find it in Google search. Do I really have to do this? When I started I was not aware of Google webmaster, analytics and adsense. I really picked up one by one and that was through hard way. It has to be the way, you have explained the things. While going though your course I just checked my sitelinks they are no more there. I really don't know how they have disappeared.Amazing. I need to explore that now. Thanks for this great share.You rock with your tech university. Mayura, on the crawl rate are you recommending to set it yourself? In the example I see you have it checked off, curious about that. Great post - thanks! You remind me of some questions I've got from a blogger experiencing issues in Google search after using GWMT. So I wanted to mention what to use and what not to without any knowledge :) First off, we need to know what's safe, right? I hope it will help you on configuring your sites on GWMT Sylviane :) I believe it's quite understandable, but questions are always welcome. I've been to your profile today just to see if they were added already and noticed 'em :) You have made it. It will take some time for Google to re-crawl and fetch the author information dear. Google crawls and indexes your blog with no prior invitations dear :) That's why you can see search results related to your blog. GWMT is a place where it gives more control to bloggers and webmasters, and most importantly you can find errors that Google experiencing on your site. Probably you are using a new email address when commenting Angela :) If so, you need to set up Gravatar for your new email. Cool... It may take time but will be worthy for sure dear :) I had no clue about GWMT when I start off too. Sitelinks are just unpredictable right now dear :) Sometimes you find sitelinks there, but another day it's just gone. I've seen 'em always with popular sites. May be Google still rolling out for everyone or experimenting with it. However it's not easy to determine what to show up just depending on the popularity :) Mmm... Will keep eye on it. This is great stuff. I struggle to understand certain aspects of GWMT a lot of the time. Currently I don't have a preferred domain set. I wasn't sure whether to or not. Does it make a real difference to SEO? Do you have a 301 redirect set up to redirect from your non-preferred domain? Hello Mayura, I've heard about Google webmaster tools but never gave it much of a chance. After reading this article I may give it a try to see how it performs. Most of the time Google provides us with some very help tools so that we may get the best results form our websites. Actually it doesn't have a SEO benefit Tim :) It's about the consistency of URLs displayed in Google search results and in case Google crawls a URL from your non-preferred domain, Google will display the URL as it's coming from your preferred domain. Thanks for coming by and sharing your thoughts on the topic mate :) Glad you asked the question as it might help others stop by here too. You'd love it when you get to know mate :) Actually GWMT is an important tool for bloggers and webmasters. But it can be confusing at start. I hope you will give it a try and find out how helpful it is for you mate :) Then you won't give it up. Great Post Mayura as always. I think I was not patient with the steps. I tried to follow the steps in your last post and something stopped me and I discontinued. I need to go back and add my site and follow all the steps all over again. If something stopped me I will have to reach out to you my friend this time. Thanks Mayura for all the tutorials and the hard work you put into them to share it all with us. You are amazing. It's still a little confusing but I know I can come here and find some help :) Thank you for putting this together Mayura. Hope things are well. your this article is really appreciable in my eyes. Really lot of people don't know how to use/mange website in Google webmaste tool. This article can teach for manage a website in easy way. Thanks for coming by and sharing your comment on this topic Neamat :) I really appreciate your compliments as that's what inspires me all the time. OK I'm totally confused. I just cannot wrap this around my head. Maybe you were thinking of me when you started the blog by saying some people will find this confusing he he! Thanks for this, Mayura - apart from setting my preferred domain I've left all the other settings as default for now. It's a bit technical for me, but I do feel I have a better understanding having read this article and your step-by-step instructions are very easy to follow - you're a good teacher! lol :D No... I had someone else in my mind though. Of course you can do and learn slowly dear :) You can do it while being in the safe zone. Well, you gotta start with previous one though. If you got any questions, reach me here. We can see about hiring later :D lol... I'm sure you will do it all alone before that. Oh YEAH... I'm sure that would feel technical but give it some time dear. You will get to know better :) I couldn't made it in few days either. Hi Mayura, I am like Donna as I think you know and do not do too well at technical stuff. I always love the way you explain these things in steps. I think even I could do this. I hope you will follow and get to know about settings better Sue :) Actually, one setting to change here and others to just for learning purpose. Thanks so much for your help with this, Mayura. I have wondered about this for a long time. Okay, Mayura, I tried to do this but I received an error message that I need to verify http://wonderoftech.com. Part of the process of setting a preferred domain is to verify that you own http://wonderoftech.com/. Please verify http://wonderoftech.com/. How do I do that? I've verified my www. site name so what's different? You're welcome Carolyn :) I'm glad to help you out with it dear. Well, you gotta verify non-www version in GWMT in order to select preferred domain. You know, www and non-www versions are technically different though they appears to be in the same domain. Things can be different sometimes, as both can host two different sites in both URLs. Generally, the one who has access to root domain considered as the owner where owner can allow someone else to host on www version. If someone else hosted on your www version, you don't wanna allow that person to set preferred domain which affects on non-www version. Would you? ;) That's why Google asks for ownership. In your case, as both URLs pointed to the same blog, you won't need to follow all the verification steps again unless you removed previous verification tag or page. Just go ahead and add non-www version to GWMT. You will find it's already verified :) Well, if verification tag is already there. That was perfect, thanks, Mayura. I just verified my site without the www and it worked the first time. Yea! Thanks as always for your wonderful help, Mayura! I have never really used Google Webmaster Tools but am interested in finding out how to use them. I think it is something that I just did not learn because it looked complicated. Your explanation is great and I am understanding it now. Why not, go ahead and get started Ann :) I'm sure you will be glad you did. Great series mate, I'm just going through it now. I'm having trouble with Webmaster tools as when I tried preferred domain I was told I needed to verify the site.... I done that over a year ago and have checked that the file is still in pace, which it is. I've gone through users and made sure that I'm verified so there's an error there somewhere. I'm also having trouble with Googlebots not being able to access my site. When I transferred to HostGator I started using Attracta as it was free SEO tools. Who tell me that because I use them it's normal for the googlebots not to access my site. Google say it's down to my robots.txt file but they're not blocked there at all. Sorry about being late to reply mate. Really glad to hear you have found the series helpful Barry :) Well, in order to select the preferred domain you need to verify both of your www and non-www versions to tell Google that you own both domains. Still having issues with Googlebots (and Bing) not being able to access site, which I think is due to Attracta... Who are no help at all. I'll read your other replies Mayura and check part 4 again. Did you see you got a special mention in my last post? I know mate :) You know it by your own experience. Oh, that's alright as it's something you aware of Barry. Hmm... I've been through your site and source code as you messaged me about this issues and I believe Attracta getting in there as it writes robots.txt with their version of sitemap. You don't need to worry 'cause there's some ways we can figure that out which I've mentioned in the reply on Facebook and even we can write robots.txt manually if everything fails mate.